We are in full turkey mode. It's the weekend of delivery. People visit to help. And then people pickup their birds at a variety of spots. There is a very real deadline for turkeys. About 90% of the birds we grow are served for Thanksgiving. And those people don't want their turkey a day or two late. The timing matters! A year ago we had our gear serviced. 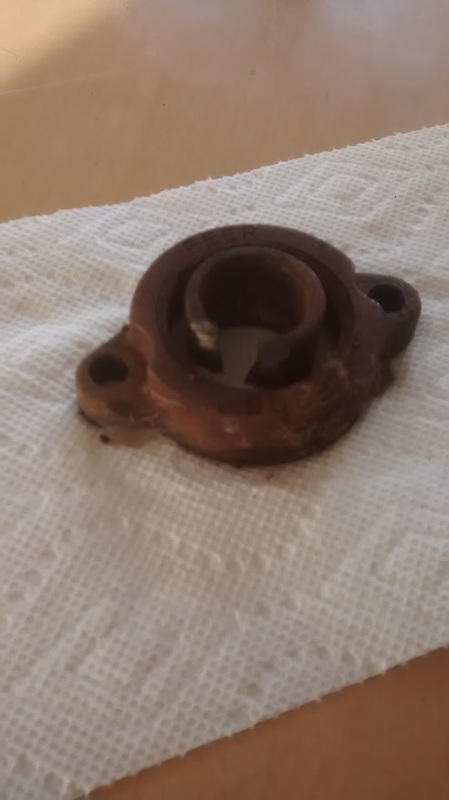 Bearings needed replaced. Transport to the manufacturer, time spent waiting for repair, late night return to farm. Homer had the foresight to purchase an extra piece. It's a...something to do with bearings, shafts, set screws...things I don't know much about. Yesterday the equipment started to malfunction. Things did not work quite as smoothly as usual. He pulled this piece and replaced it with the one he had in reserve. So we are operating without a hitch, still working towards that deadline. It takes many skills to be a farmer. Homer has them. Repairing things, in place, before the sun is up is just one. Getting the extra, specific parts is another. Supplying seamlessly, on time is one more. I'm astonished that the year is almost over. It has been a beautiful year for growing, with regular rain and a warm but not broiling summer and a gorgeous prolonged fall with many warm days. We are gearing up for our huge final push of the year. Turkeys go from field to table, and the work involved in getting them from one form to another is intense. Thankfully we have plenty of help, most of the birds are ordered by folks love good eats, and we are tickled to be able to provide such a tasty treat. The hens are still laying plenty of eggs. And the spinach crop is looking abundant. As we face the impending cold of winter we continue to build a better system of getting warm while it is cold out, using the sun to our full advantage, and some old school insulation to boot!